New Posh signing Jack Collison (righ) with manager Dave Robertson. Photo: Joe Dent/theposh.com. Posh have today (May 29) completed the signing of former West Ham midfielder Jack Collison on a one-year contract. The 26-year-old spent time in the Posh Academy and the Cambridge United youth set-up before joining West Ham’s Academy after impressing on a trial with the Hammers. Collison went on to play over 100 games for the Hammers scoring 14 goals and has made 17 appearances at international level. Posh boss Dave Robertson was delighted with his first summer acquisition and said: “I have been speaking with Jack for a number of weeks now and I am delighted that he has agreed to join the club and bought into what we are trying to achieve here. He brings a lot of experience and has obviously played at the highest level both with West Ham United and with his country Wales. 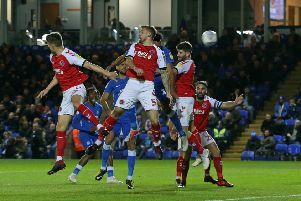 Collison has also spent time at AFC Bournemouth, Wigan Athletic and Ipswich Town during his career and has been linked with a host of clubs since his departure from Portman Road. Collison said: “It feels a bit like a fairytale because I started my career at Peterborough in the Academy so it is great to be back here. I knew the manager back then and I have been speaking with him and I believe in his plans for this football club. The manager has played a massive part in my decision to sign here.